Submitted by Dana Gordon on July 17, 2013. Painting is a conversation, and talking about the future always involves new ways of discussing the past. As inspired by our canonized masters as we may be, we must recognize when their influence begins to hold us back as much as it once spurred us on and look beyond the old heroes to previously unrecognized or overlooked models. Over email this past week, painter Dana Gordon and I discussed this notion and our mutual opinions of two overlooked painters, Nicolas de Staël, whose work I wrote about recently, and Camille Pissarro. The visual generosity that underpins their work stands in stark contrast to the reductive tendencies in painting of the last 150 years. That, perhaps, is one clue to their relative obscurity. For over a century, the painter Paul Cézanne (1839-1906) has been considered the father of modern art. His ascendancy, which began around 1894, had a tidal influence on the development of the avant-garde, leading to both abstraction and expressionism, commanding the fealty of Picasso and Matisse, dominating the standard narrative of the development of modernism through the late 20th century, and lingering today. But things did not always look this way. For most of the late 19th century, it was not Cézanne but the painter Camille Pissarro (1830-1903) who was revered as the greater master, and as one of the most influential creators of modern art. 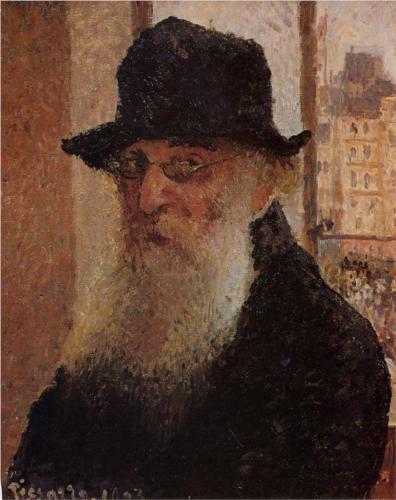 Thanks to the twists of history, however, Pissarro’s reputation subsequently ebbed to the point where he came to be recalled, often dismissively, as a vaguely important and skillful landscapist among the Impressionists and, dimly, as the first great Jewish modern artist. Over the past quarter-century, in a quiet countermovement, Pissarro’s significance has been revived. Essays and exhibitions, including one at the Jewish Museum in New York in 1995, have shed new light on his achievement, suggesting in particular that Cézanne’s own career would not have been possible without the precedence of Pissarro. Recently abetting this trend has been a vibrant and informative show organized this past summer by the Museum of Modern Art (MOMA) in New York and now on tour [please note this exhibition took place in 2005 - ed.]. From 1861 until the mid-1880’s, Pissarro and Cézanne carried on a deep artistic and personal in- teraction that had a determining effect on the future of art. This interaction is the subject of the exhibit now on tour. But despite its many virtues, the show does not by itself illumine the full story of the Pissarro-Cézanne relationship, or of Pissarro himself; nor does it really make clear how to appreciate the latter’s work. Most cultured eyes still see early modern art, including Pissarro’s, through a Cézanne-derived screen, and a whole understanding of the modernist movement in art follows from this perception. Is it right? As far back as 1953, the abstract-expressionist painter Barnett Newman complained that the Museum of Modern Art, the temple of modernism in art, had “dedicated itself” to the proposition that Cézanne was “the father of modern art, [with] Marcel Duchamp as his self-appointed heir.” In so doing, Newman declared, the museum was perpetuating a “false history.” There is much to Newman’s charge. Camille Pissarro was born on the island of St. Thomas in the Caribbean, a child of middle-class Jewish merchants originally from Bordeaux. Schooled in Paris from 1841 to 1847, he went back to the island to enter the family business, but eventually sloughed off his family’s expectations to go draw and paint in Venezuela. He returned to Paris for good in 1855, followed not long afterward by his parents. In 1860, Pissarro began a liaison with Julie Vellay, his mother’s cook’s assistant. They married in 1871, had eight children, and remained together until Camille’s death in 1903. 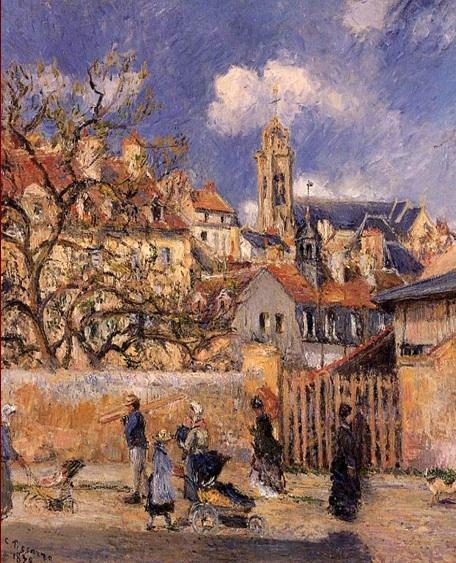 The relationship cost him a large part of his mother’s affections and financial support; as a consequence, most of Pissarro’s adult life would be a dire struggle for money. But his open and defiant commitment to Julie was an early example of the personal and artistic independence for which he became known. It also provided a kind of shelter for his friends Cézanne and Monet and their paramours during the family storms caused by their own pre-marital liaisons. 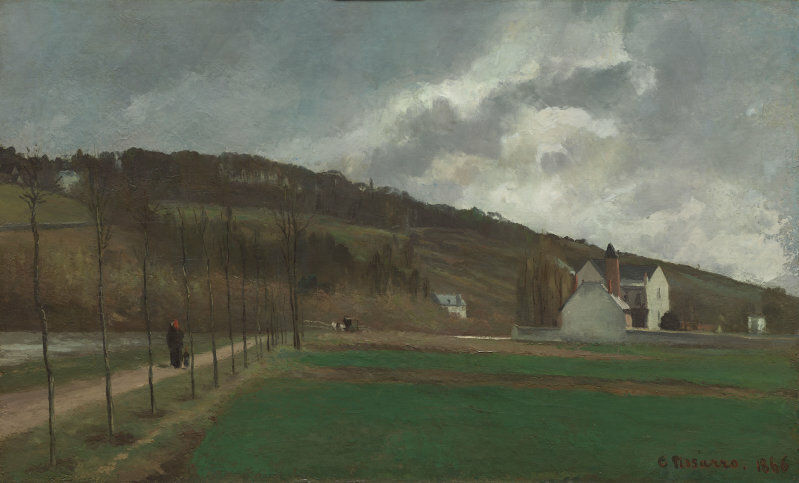 After the mid-1860’s, Pissarro took up residence in small towns just outside of Paris, where living was less costly and his favored rural motifs lay nearby. He made frequent trips into the city, often staying for days, but many artists also came out to visit and work near him—most notably Claude Monet for six months in 1869-70 and Cézanne and Paul Gauguin in the 1870’s and 80’s. Of Camille and Julie’s children, several became artists themselves, most prominently Lucien, the eldest son. Pissarro’s letters to Lucien offer a trove of insight into a painter’s life and into the history of 19th-century art. 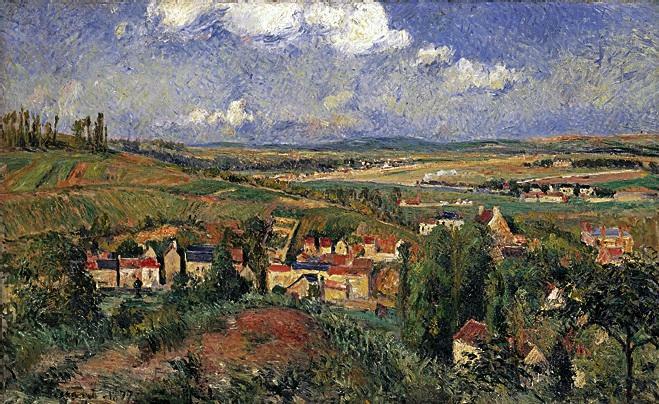 Pissarro was twenty-five when he returned to Paris from the Caribbean, already an experienced landscape painter and free of the stultifying conventions of the French academies. During the late 1850’s, he sought out his great predecessors in French art: Corot, Courbet, Delacroix, and others. Influenced by them, but never a disciple, he integrated what he learned into his own vision. At the same time as Edouard Manet, Pissarro developed a new approach emphasizing the full, direct response of the artist to the nature in which he exists. Pissarro’s significance was recognized early on by his peers—and fitfully by officialdom. In the 1850’s, 60’s, and early 70’s, international “Salon” exhibitions offered the only hope for commercial success and acclaim in France. But admission was controlled by adherents of the Ecole des Beaux Arts, whose teachers held to a petrifying methodology. Vanguard artists had to deal with the Salons or, somehow, without them. These early responses indicate clearly enough that Pissarro was creating something unusual. In fact, he was inventing abstraction, the ingredients of which he had gleaned from his precursors. As early as 1864, he was using elements of landscape as abstract designs, making lines and shapes be lines and shapes as well as representations of objects and scenic depth. The “winter landscape” to which Zola referred, Banks of the Marne in Winter, was one of these works. Included in the MOMA show, it is full of the abstraction Pissarro was inventing. The trees on the left of the painting are an essay of lines, the houses on the right make up a play of triangular and trapezoidal shapes. The entire lower-right quadrant is a kind of “color-field” painting, concerned with the communicative powers of color and brushstroke independently of what they depict. The smudges of paint on the far right, standing in for houses, declare that smudges of paint carry qualities of beauty in their own right. The originality here is profoundly human. It is not derived from a certain facility of hand or from a falsification of nature. It stems from the very temperament of the painter himself and comprises a feeling for truth resulting from an inner conviction. Never before have paintings appeared to me to possess such an overwhelming dignity. Monet has often been represented as the genius of Impressionism, and a genius he certainly was. He was also the instigator of the first Impressionist exhibition in 1874. Nevertheless, in a review of that show, the critic Armand Silvestre could refer to Pissarro as “basically the inventor of this painting.” One can see why. And Cézanne? For over 20 years, from the time they met in 1861, he sought and received Pissarro’s advice and help. The young Cézanne, awkward in art as in person, was ridiculed in Paris—but not by Pissarro, who, perhaps seeing something of himself in the impolitic frankness of the younger man’s work, recognized his unusual talent immediately and never faltered in his support. The two became close friends; by the early 1870’s, Cézanne was so eager to work in Pissarro’s company that he moved near him. That they influenced each other is beyond doubt. “We were al- ways together!,” Pissarro wrote of those years, when the volatile Cézanne’s attachment was intense. In particular, Pissarro’s obsessive approach to work, to mining his own vision, helped Cézanne to release his blocked personality, showing him how emotional content would come on its own and allowing him to channel his anxious energy into the formal problems of painting. From Pissarro, Cézanne learned abstraction, the expressive little brushstroke, emphasis on form rather than sentiment, and how to make form with color and without outline. Frequently, the two artists painted the same view at the same time; a number of the resulting pictures were hung next to each other at the MOMA show, giving the viewer an extraordinary “you are there” sensation. In the mid-1870’s, Cézanne began a long seclusion in Aix, near the Mediterranean, removing himself from the Paris scene almost entirely. From there, in 1876, he wrote to Pissarro, “It’s like a playing card. Red roofs against the blue sea.” He was acknowledging that he was painting the roofs, walls, and fields in Aix as flat, abstract forms dominated by shape and color, as Pissarro had painted ten years earlier. During the long years prior to Cézanne’s breakthrough, Pissarro provided virtually all the exposure for his work. He encouraged the merchant Père Tanguy to show Cézanne’s work at his paintshop-gallery, and urged collectors and artists to see it there. Later he convinced a new art dealer, the soon-to-be-famous Ambroise Vollard, to give Cézanne the 1895 show that made his name. Later in life, Cézanne said that “Pissarro was like a father to me: he was a man you turned to for advice, and he was something like le bon Dieu.” It is possible that Cézanne was somewhat intimidated by this divinity. At MOMA, Pissarro’s awesome Kitchen Garden of 1877 was hung next to Cézanne’s painting of the same subject in the same year, The Garden of Maubuisson. Cézanne’s version has its beauty—but, when seen with the Pissarro, it feels like a sketch, a few notations of musical ideas. By contrast, the Pissarro has the force of a great symphony. Around this time, Cézanne’s technique was evolving into repetitive arrangements of strokes. This so-called “constructive-stroke” technique was implied in many earlier Pissarro paintings as well, including, in the MOMA show, The Potato Harvest (1874) and, explosively, L’Hermitage in Summer, Pontoise (1877), an astonishing composition dense with essays of brushstroke and the poetry of color planes. But, except for a few paintings explicitly experimenting with Cézanne’s technique (three from 1883-84 were in the MOMA show), Pissarro never really adopted it, preferring instead to give individual meaning to every moment and stroke in the composition. Cézanne acknowledged this cost, writing that “coloring sensations force me to produce abstract passages that stop me from covering my whole canvas or from pushing to the full delineation of objects.” In other words, he could not complete the paintings as scenes or as recognizable objects because he had already completed them as compositions of purely visual events. His use of techniques of abstraction richly enforced but did not get much beyond the impression of overall flatness. Pissarro’s paintings, by contrast, have tremendous depth. They invite you in; you can enter and breathe and look around both the abstraction and the depicted scene, as if taking a tour of the artist’s thought process. 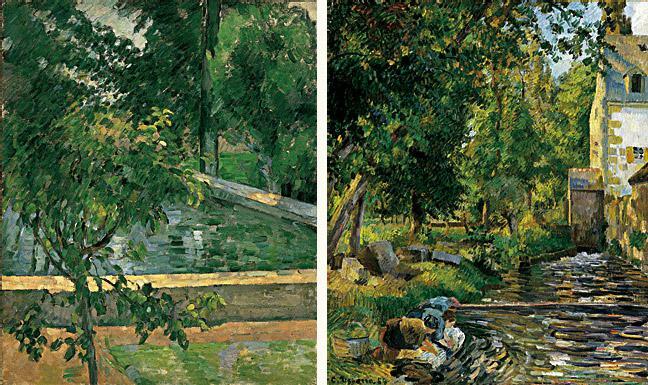 (In this connection, it is especially instructive to compare two paintings included in the MOMA show, Pissarro’s intricate The Conversation  with Cézanne’s House of the Hanged Man .) But Pissarro’s fullness, warmth, and solidity are not what later painters got from the early abstract artists, or what became the accepted taste of the 20th century. Instead, they got Cézanne’s flatness and assertion of color, often without the high quality of painting that made Cézanne’s own work so convincing. “Pissarro was possessed of a remarkable eye that led him to appreciate the genius of Cézanne, Gauguin, and [Georges] Seurat before all other painters,” wrote Françoise Cachin, the director of the Musées de France, in 1995. This is very true, and it applies to more painters than she named. Gauguin was Pissarro’s protégé for many years, and his mature work, seemingly very different from Pissarro’s, is full of the latter’s inventions. Vincent van Gogh, the troubled genius who arrived in Paris in 1886, also spent time with Pissarro, learning from him that, as he would later write, “you must boldly exaggerate the effects of either harmony or discord which colors produce.” Vincent’s brother Theo, an art dealer in Paris, was another Pissarro enthusiast, whose death in 1891 dealt a blow to Pissarro’s commercial hopes. Nor were Gauguin and Van Gogh the end of it. In the mid- to late-1880’s, Pissarro would be accused of aping the neo-Impressionism and pointillism of the much younger Seurat and Paul Signac. But Pissarro did not follow them, he led them. Although Seurat certainly had his own sensibility, all of his work’s stylistic attributes can first be found in Pissarro: the color theory, the tightly compacted strokes, the way the dots of paint coalesce into abstract patterns, even the stiff hieratic figures. One can trace, in specific paintings, what Seurat learned from Pissarro, even as Pissarro went deeper into the human spirit and saw farther into the future. In the 1890’s Pissarro developed a new aesthetic density in his complex cityscapes, figure paintings, and landscapes. These, although less well known today than his earlier landscapes, made a strong impact, most notably on Henri Matisse (1869- 1954). The meeting in 1897 of this struggling young painter, who would rightly come to be considered the greatest artist of the 20th century, with the living embodiment of painting’s long journey in the 19th moved Matisse to tears. He came away likening Pissarro to the long-bearded figure of the prophet Moses as sculpted on the Well (or Fountain) of Moses, a well-known Gothic masterpiece in Dijon. Pissarro was indeed a Jew with a long white beard and a biblical mien, and Matisse was hardly the first to liken him to Moses. But Matisse may have been thinking less of the figure and more of the fountain—of Pissarro as a living source, with a flowing generosity of spirit. He certainly saw in Pissarro an exemplary survivor of a long, difficult life dedicated to art. 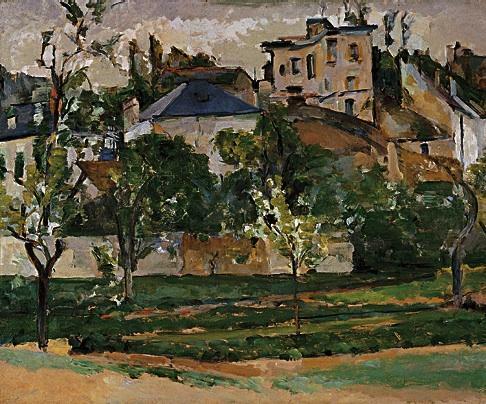 If, later on, when Pissarro was no longer so esteemed, Matisse spoke less of him and more of Cézanne, in 1898 he was frequently in the apartment Pissarro had rented to paint his views of the Tuileries. Pissarro was Matisse’s master, present in his work in many ways, including some later attributed to Cézanne. 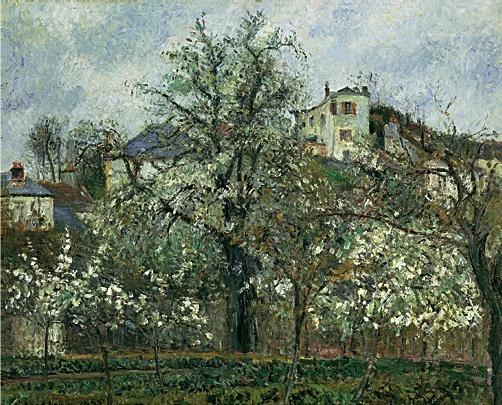 Pissarro was also still a presence in 1900-01 when Pablo Picasso entered the Paris art world, and his touch and his inventions can be seen both in the dense little brushstrokes of the classical cubism associated with Picasso and Georges Braque and in the flat, colored planes of later cubism. Many later painters, too, including those who sought an abstraction free of the constrictions of cubism, carried a Pissarro gene, whether or not they were aware of it. 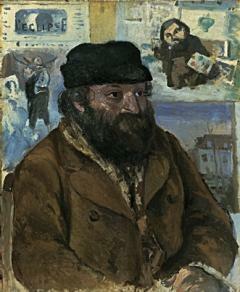 Testimonies to Pissarro’s unique character have come down to us through personal recollections and through his interactions with other artists. Though not shy about his own work, he was neither a raging egotist nor a pushy self-promoter— two useful personas for an artist. He was generous in sharing his insights and, as we have seen, unself ish in the support he gave to others. “The first thing that struck one in Pissarro,” Ambroise Vollard observed, “was his air of kindness, of delicacy, and at the same time of serenity.” Thadée Natanson, editor of La Revue Blanche in the 1890’s, recalled him as “infallible, infinitely kind and just.” In the phrase of Christopher Lloyd, whose writings have contributed greatly to the revival of Pissarro, he played an “almost rabbinical role” in French painting. And then there is Pissarro’s Jewishness. Did it, perhaps, play a role in the eventual eclipse of his stature? Though he did not participate in religious formalities, Pissarro never dissimulated his Jewish identity—to all appearances, he enjoyed it. But anti-Semitism was rife in all social classes in the France of the 1860’s and later, despite the constitutional guarantees of freedom of religion instituted under Napoleon I. By the 1890’s, when France had become a republic, there were anti-Semitic riots during the panic over anarchism, and then the Dreyfus affair. Still, one can make too much of this. Anti-Semitism does not appear to have been the main determinant in the avant-garde’s view of Pissarro. He was, to say the very least, accepted as one among them. Indeed, it is possible that some of Pissarro’s contemporaries considered his Jewishness an important and positive element in what he brought, both to the art of painting and to the art of human existence. In likening Pissarro to Moses, the giver of the law, Matisse and others were undoubtedly paying tribute not only to his new way of seeing but to his way of living—moral, responsible, whole. Whatever complex of factors explains the ebbing of his reputation, his Jewishness seems to have played, at most, a minor role in it.